Terence Frazor has led operatic performances and symphony orchestras in Europe, Central and South America, as well as throughout Mexico, Canada, and the United States. Among the many orchestras with which he has appeared as guest conductor are theSao Paulo State Symphony (Brazil), the UNAM Philharmonic (Mexico City), Symphony Orchestra of Zurich (Switzerland), the Brooklyn Philharmonia (New York City), and the National Orchestra of El Salvador. Mr. Frazor is a graduate of the Mannes College of Music (New York City), where he studied with Paul Berl; and the Mozarteum (Salzburg), where he worked with Carl Melles and Herbert von Karajan. He also studied conducting at McGill University (Montreal) with Alexander Brott and with Igor Markevitch in Monaco. Beginning his professional career in New York City, Mr. Frazor held the positions of assistant conductor to the legendary Leopold Stokowski and the American Symphony Orchestra, and assistant conductor to Julius Rudel at the Caramoor Festival (New York). He also served as Music Director of New York City's Bel Canto Opera Company, where he conducted many operas from the standard repertoire, as well as productions of lesser known works. In addition to several highly successful concert tours with the Bournemouth Sinfonietta throughout the south of England, Mr. Frazor has conducted that orchestra on several recordings which include the music of Mozart, Villa-Lobos, Rodrigo, and Mexican composer Eduardo Angulo. 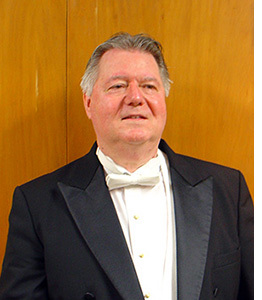 Terence Frazor is the founder of the Laredo Philharmonic Orchestra (Texas) and served as Music Director and Conductor of that ensemble for twenty-two years. He is currently a member of the music faculty of University of the Incarnate Word and conductor of UIW's Orchestra of the Incarnate Word. In 2011, Mr. Frazor founded the MozartFestival Texas, comprised of some of south Texas' most distinguished musicians as well as a fully professional orchestra. The Mozart Festival Texas performs each summer in San Antonio and is in residence at University of the Incarnate Word.